Fat Burning Workouts That Really Work will break down your workouts into 4 Training Zones. First is the Warm-Up, then the Fat-burning, followed by the Aerobic and then the Anaerobic Zone. The 5th and best zone IS the After-Burn Zone. There are a lot of misconceptions about burning fat, and what it means to be in the “fat burning zone”. 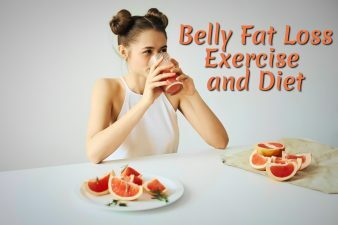 The fat burning zone refers to the practice of exercising at low-intensities for longer periods of time, meaning that you will burn actual fat instead of just glycogen. Glycogen is carbohydrates, or converted sugars, stored in the muscles and liver. When we exercise, our bodies use energy from two sources: fat and stored glycogen. You will burn more fat during low-intensity exercise, though calories will be burned at a slower rate. What does all this mean? 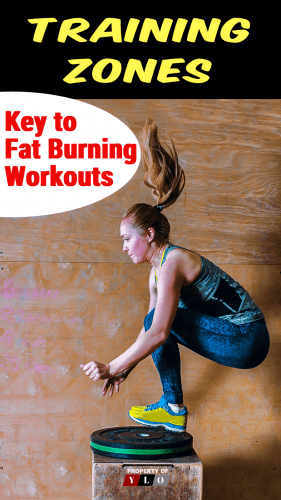 It means that exercising in the fat burning zone is not the answer to losing fat. Working out at different intensities has different results on the body. That being said, working out in different training zones can be critical to a well-rounded workout session. Fat burning workouts that really work use ALL the training zones. So, let’s take a look at the different training zones. The warm-up zone is the place to start each workout. That statement is important enough to repeat. THE WARM-UP ZONE IS THE PLACE TO START EACH WORKOUT. It eases your muscles and body into movement and it signals that it is time to start burning fat so the body has the energy to keep moving. For runners, a mix of jogging and walking is a great warm-up activity. Any type of HIIT workout should begin with stretching followed by light jumping jacks and squats to rehearse for the main show. The warm-up zone matters. It helps your cardio-respiratory system prepare to workout longer and harder than if you just jumped into a full workout activity. An additional benefit to warming up is that your mind a chance to get ready to exercise and keep up the pace. Warming-up is a safe practice. It mobilizes your joints and can help prevent injury during exercise. For all the runners out there, not warming-up can lead to torn muscles and side cramps. This is the lowest heart rate of all the workout phases. Again, it indicates activity that requires more energy but is not the greatest way to burn fat or an indicator of the body’s performance. The fat burning zone means that you are working comfortably. Walking for a few minutes, for example, would enter you into the fat burning zone even though we don’t normally regard that activity as ‘cardio’ or as ‘intense’. After warming up and getting your heart pumping a little faster in the fat burning zone, you can crank up the treadmill or elliptical a few speeds and enter into Zone 3 or the aerobic zone. As “aero” indicates, this phase uses air and the level of effort needed to get your heart rate up to Zone 3 will have you breathing harder and breaking a sweat. 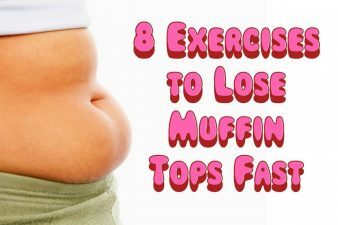 During this time, your body will begin burning available sugars and some of the stored fat deposits. It is a comfortable zone to exercise in, but you usually don’t stay in this zone for too long. As you keep moving and increasing your pace, you will find yourself in the anaerobic zone, or Zone 4. 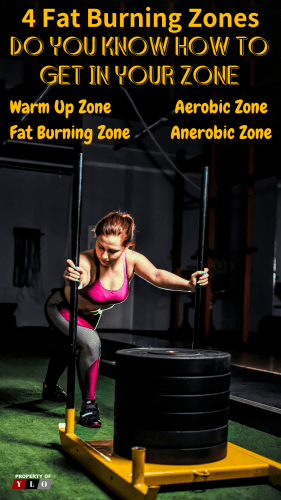 The anaerobic zone will have you panting and sweating. It is a difficult level of energy and a hard pace to maintain, though it is the highest calorie burning zone. This zone will have you hitting your maximum heart rate. A fast run or all-out sprint will get you into Zone 4. It is difficult to stay at this level, especially for beginners or people who have been skipping the gym a little bit too much recently (no judgment). Given the challenge, interval training has become a great solution to keeping your heart going without exhausting you too quickly. You push yourself for about 30 seconds (or more if it is comfortable) and then slow your pace down just a bit and then repeat. A running/jogging combo is a great example of interval exercise. Plus, moving between Zones 3 & 4 will have your body burning the most calories and fat in order to keep up the pace. Staying with the anaerobic zone through interval exercise is the key to accessing the after-burn or Excess Post-Oxygen Consumption (EPOC). The 5th Zone is when your body will continue burning calories even after you’ve stopped your workout. The anaerobic zone differentiates between high-intensity workouts that have your heart rate up, your shirt drenched with sweat, and the low-intensity workouts such as walking or jogging that elevate your heart rate to a consistent rate. 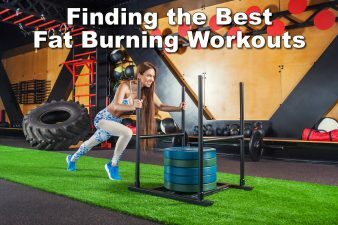 So What Is The Best Way To Burn Fat? The best way to burn fat would be to flirt with each zone during a workout. Just as using different muscles will help you create a well-rounded body, working in every zone for a duration of time will help your body burn the most fat. Moving between phases helps you gain endurance or the ability to workout longer and harder. Think of it this way, if you just went into a full sprint you could maybe keep it up for 30 seconds or a few minutes if you’re really in shape. And then that’s it. You’re tired, out of breath, and your muscles may ache. But to warm-up, and then work a little harder, work really hard, and then bring it down a little, work really hard, bring it down a little ….. you get the idea. Interval workouts and transitioning between zones give you a well-rounded workout that keeps you burning calories and fat the entire time. It also allows you to keep up the fat burning through longer and more intense workouts. So mix it up! Keep your body on its toes so to speak. Don’t get comfortable with a workout, keep challenging yourself by staying in different zones for different periods of time. The worst type of exercise is a comfortable exercise that doesn’t surprise your body or your fat cells. Mix up the routine—your waistline or other problem areas will thank you! REMEMBER, the Zone you want to reach every time you workout is ZONE 5! A helpful article by WebMD: 24 Hours of Fat Burning From Exercise?